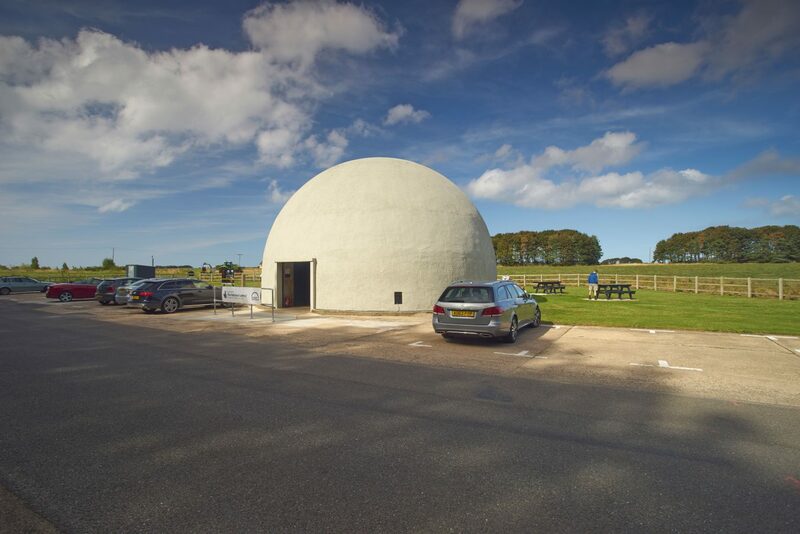 Long before virtual reality, Langham Dome was one of forty structures designed and built in 1942 to train anti-aircraft gunners. A secret installation during the war, servicemen trained on a replica gun ‘shooting’ at moving images of enemy aircraft projected onto the curved wall, along with sound effects. The intended purpose, improving accuracy while shooting at enemy aircraft, was finally revealed by an author in his book on military airfield architecture. Once shrouded in mystery and fallen into ruin, Langham Dome was restored into a new interpretative tourist attraction and museum, supported by funding from Heritage Lottery Fund, English Heritage among others. With digital virtual reality now far more advanced, we were approached after the highly successful and equally challenging ‘curved’ Forum Fusion project. 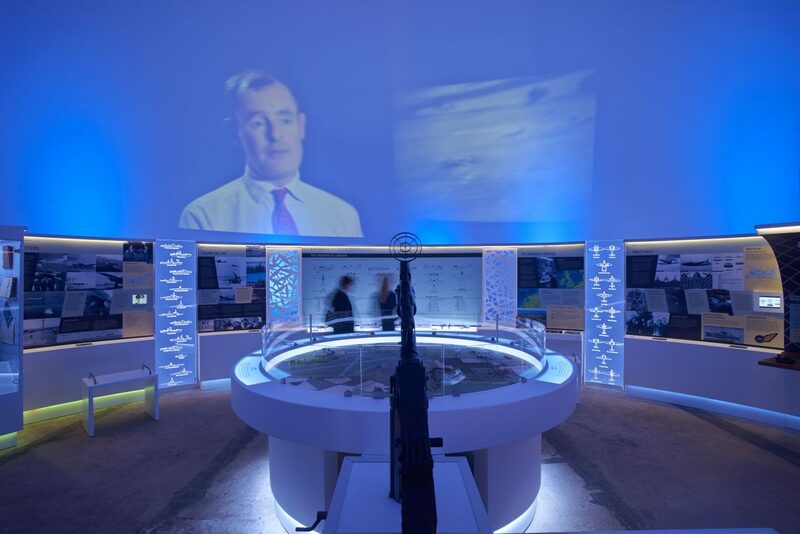 Priorities: The capabilities of the AV systems had to ensure the Langham Dome experience was well worth more visits, which is crucial to self-sustenance and minimum reliance on external funding for the site. The Langham Experience: for an education centre and tourist attraction, the brief specified recreating Langham Dome’s original purpose in ways which allow visitors to participate rather than simply walk through and observe from a distance. 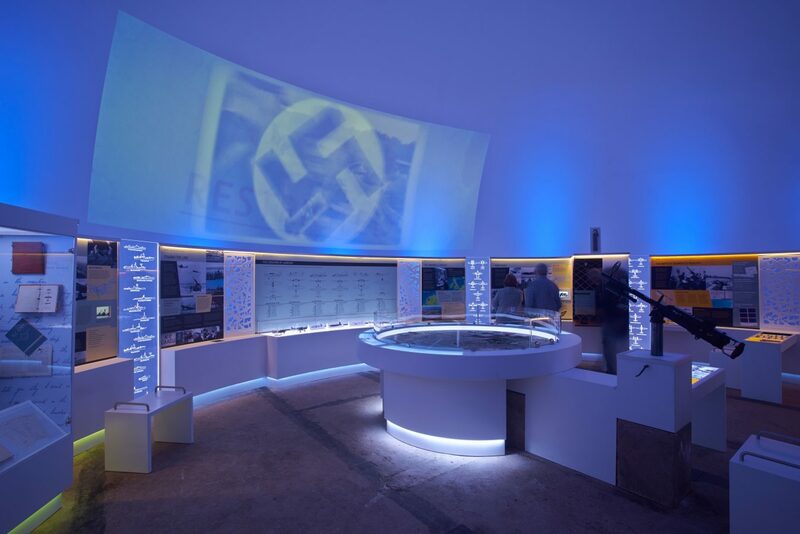 Part of the brief was to integrate a system where visitors can share historical content of relevance and display them on a separate projection system; essentially building two separate projections systems. We brought transferable expertise from our work on edge-blended projection systems at The Forum in Norwich (with similar curved walls). In order to meet the challenge of projecting directly onto curved walls, two edge-blended laser projectors were integrated with geometric correction capabilities. This allowed for a precise projection wrap across the curved walls without overlaps between the images projected by each projector unit. Priorities: After a thorough evaluation of priorities for the Trust and the visitor experience, the projection hardware were selected on the basis of their lowest maintenance costs (20,000 hours lamp life) without compromise on projection quality. To address the second requirement for visitor’s own content, another laser projector system was integrated for local HDMI, VGA and Audio inputs. In collaboration with the creative media agency, Ugly Studios, we worked to find richer ways to exhibit the stories of the men and women from around the world who were based at RAF Langham during WW2. 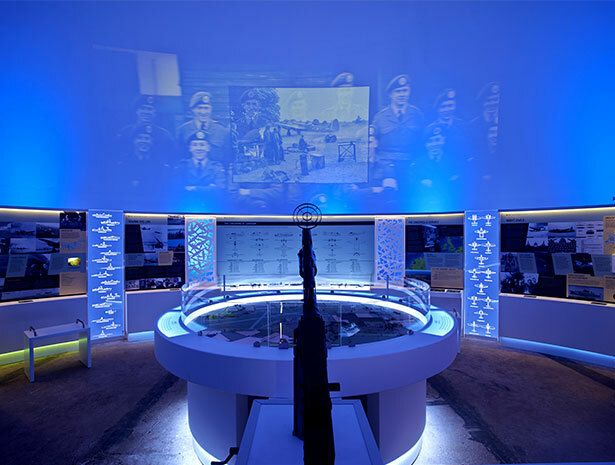 Projection management to create edge-blended curved images, two Dataton media players were installed, while audio capabilities were delivered with a Bose surround audio system to reproduce the immersive sound of oncoming aircrafts or from visitor supplied content. 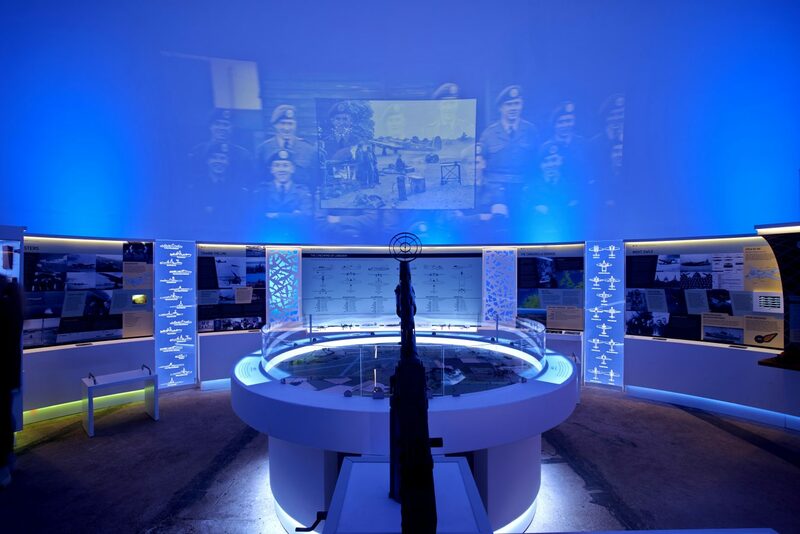 In addition, four weeks after the successful delivery of the original project, Friends of Langham Dome (FoLD) approached Snelling to supply and fit an additional 10 headphone distribution systems for visitors who wanted to sit inside the Dome at designated areas and listen to the videos and interviews, while other visitors interacted with the projection and artefacts. 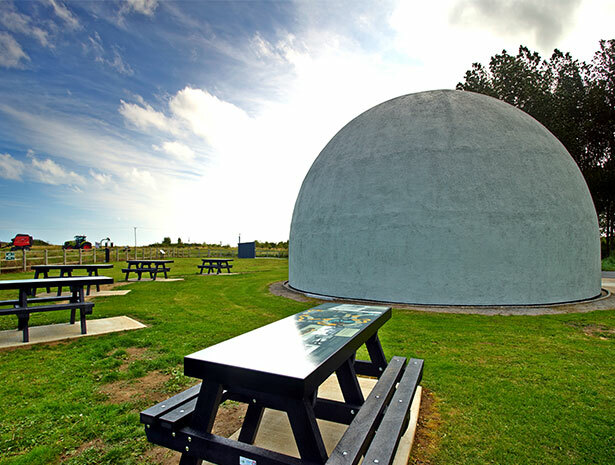 Langham Dome opened to the public in July 2014 and Patrick Allen, Chairman of FoLD says ‘The dome will be a fitting memorial to those who served in it”. Learn more about the Langham Dome commission. Download the casebook. We overcome acoustic limitations of a Grade II listed building, which render spoken words unintelligible to the audience, while being sympathetic to the building’s period character?